Have you ever wondered why Dante’s most famous work is called The Divine Comedy? Perhaps, in high school or college, you read selections from the opening section, “Inferno,” which depicts an imagined journey through hell. There was certainly bitter humor there, with sinners punished in macabre tortures that mirrored the sins they committed during life – the adulterers locked in eternal embrace, liars marching through knee-deep manure – but there wasn’t anything comedic about it. It was terrifying, as Dante intended. Ancient critics classified drama into two basic categories: tragedy and comedy. The most basic distinction between the two was the ending. A tragedy, no matter how happy or humorous individual scenes may be, always ended badly — in death — for the protagonists. No matter how romantic the first meeting between Romeo and Juliet might be, no matter how close it seems Hamlet comes to discovering the truth about his father’s death, we know that, because these plays are tragedies, they will end in death. This foreknowledge colors the rest of the plot, giving the romance or close calls with success a bitter overtone. A comedy, meanwhile, ends happily, usually with a joyful wedding and feast. The characters may face tribulation, even encounter brushes with death, but we know that it will all work out in the end. Not merely work out, either, but finish with a celebration. That — the joyous ending, the improvement in their lives, the discovery of true happiness — is the defining mark of a comedy. The humor of a traditional comedy, in fact, often comes from the audience’s foreknowledge that everything will be fine, making it difficult for us to take seriously any troubles faced by the heroes. Dante’s Divine Comedy has exactly this kind of ending. “Inferno” is the section most commonly read in school, but that’s only the first of three sections of the Divine Comedy. 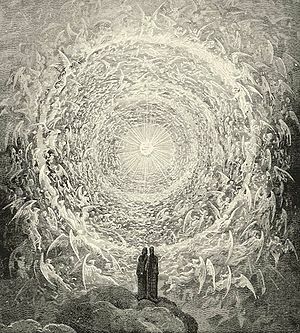 After hell, Dante’s fictional self travels on to Purgatory in “Purgatorio,” where he meets people who are on their way to perfection, and then to Heaven, “Paradiso.” The Divine Comedy concludes with a mystical vision of Dante’s encounter with God. The final book of the Bible, Revelation, depicts this moment as both a wedding and a feast – the Wedding Supper of the Lamb. It is indeed a comedy, in the truest, deepest sense of the word. While the Divine Comedy is a work of poetry – Dante’s imaginative depiction of what the afterlife is like – his vision of the cosmic story as fundamentally a comedy is rooted in the Bible’s own story. As we’ve already seen, Revelation shows us that God’s story ends with a wedding and a feast. No matter what troubles we encounter before the story ends, no matter how close we may come to tragedy, the story ends with a celebration. And that knowledge should shape how we regard everything that happens between now and then. This entry was posted in Theology and Religion and tagged Comedy, Dante Alighieri, Divine Comedy, Inferno, Paradiso, Purgatory by mhick255. Bookmark the permalink.